An SN2 reaction is a concerted process and does not involve intermediates (ruling out profile C and D). 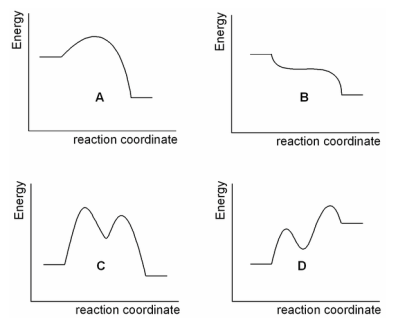 Also, reaction transition states are higher energy than the starting material leaving profile A as the only option. Recall that 2nd order reactions can be written of the type: rate = k[RX][Nucleophile] and so the total of the exponents = 2 (thus 2nd order overall = 1st order with respect to RX and 1st order with respect to the nucleophile).